Christmas, 1976, saw City reach a peak of perfection rarely seen since the great days of the last League Championship triumph of almost a decade ago. The Blues gave their fans a real festive treat as they solidly laid the Leeds bogy with a sizzling performance that smacked of fire, flair and finesse. It was a December day on which they revealed all that is good in the English game when romping to their first Elland Road victory in nearly seven years. The 2-0 success was built on the double-barrelled scoring blast from Brian Kidd, at that stage of the season the marksman-in-form. Kidd”s two goals in a brilliant win sent his total soaring to six in five games. 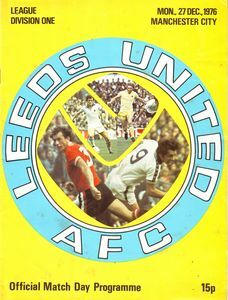 …Leeds, a team of fallen giants that day, had no answer to polished and skilful City who built on the confidence given them by a 10th minute Kidd goal when he caught the opposition square at the back when picking up a Mike Doyle clearance. As Scottish international goalkeeper David Harvey advanced from his line, Kidd cooly clipped the ball over his head and City were on their way to a memorable victory. It was the same devastating partnership that struck 18 minutes later. This time Doyle, the commanding skipper, bravely flung himself full length to head in a Dennis Tueart left wing corner. The ball fairly flew towards the far post where Kidd was positioned to add the lethal finishing touch. With his hat-trick on, Kidd shot over after 34 minutes and then three times in just two minutes after the break he again narrowly failed to score from close in positions. However, it was a far from one man show by City. Dave Watson was superb alongside the equally dependable Doyle in the centre of a defence. …lt was a game, too, in which Kenny Clements and Willie Donachie provided further evidence that they are moulding a fine full-back partnership that reduced the opposition to a minimum of scoring chances. With Doyle and Watson, they were so effective that goalkeeper Joe Corrigan hardly had a serious shot to save in 90 minutes. While Kidd was scoring the goals, his front running colleague Joe Royle was providing his part in unsettling the harrassed and nervous Leeds defence, whose only lucky break was that they found Tueart marginally short of his own demanding high standard.